Agent Comments :: Beautiful Front with Lush Landscaping. Living Room Design Details include Hardwood Floors, Open Beam Vaulted Ceiling, Single Lite Glass Doors & Clerestory Windows. Formal Dining Room includes Hardwood Floors and Wood Burning Fireplace with Gas Starter. Guest Bath off of Living Room. Gourmet Kitchen has been remodeled with Shaker Style Cabinets, Granite Counters, Island, Stainless Appliances, Recessed and Under Counter Lighting. Individual Laundry Room adjacent to Kitchen. 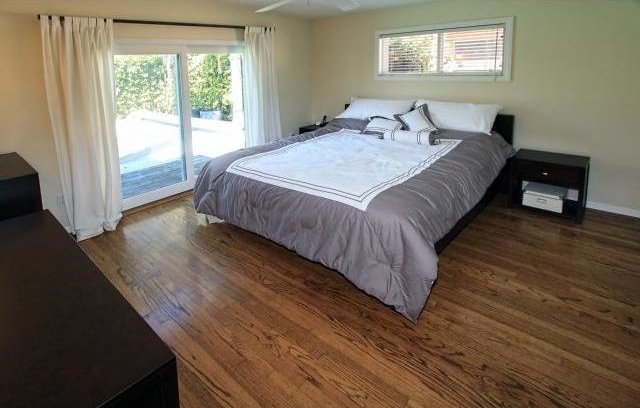 Master Bedroom features Hardwood Floors, Vaulted Ceiling and Single Lite Glass Doors to Rear Yard and Patio. All Bedrooms include Vaulted Ceilings and Hardwood Floors. Sleek, Contemporary Bath features a Neutral Palette, Tub and Pedestal Sink. Entertainer's Yard is Perfect for BBQ's or Outdoor Dining. Green and Private Yard includes a Covered Patio with Ceiling Fan and Beautiful Sparkling Pool. Kitchen and Living Room are Wired for Speakers. Wired for Alarm System. Double Car Garage with Automatic Opener, Copper Plumbing, Dual Pane Windows and Doors, Automatic Sprinklers. Walk to Park for Playground, Tennis, Bike Paths and Community Center. Just minutes from freeways.